The fifth stage on the 2016 Malaysian Tour saw Women’s World No.62 Sivasangari Subramaniam and Men’s World No.146 Mohd Syafiq Kamal secure respective wins over Hong Kong’s Vanessa Chu and World Junior Champion Eain Yow Ng to make it a home double at the Sukma Perlis Sports Complex in Kangar. 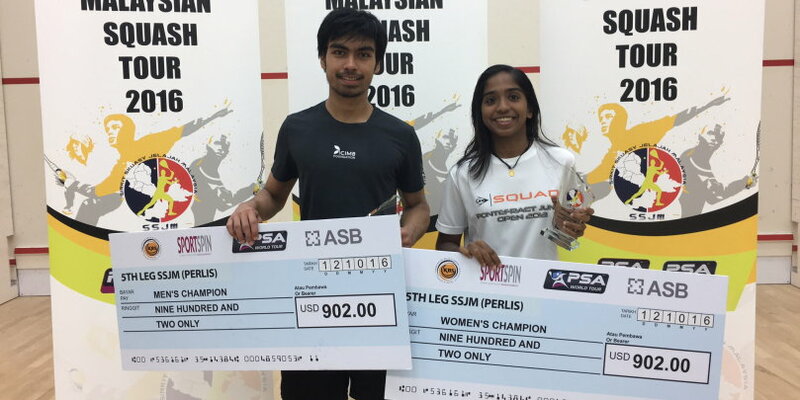 Subramaniam, 17, has had a fine 2016 after taking the title on all four previous stages of this year’s Malaysian Tour, but she was made to work hard for her victory against Chu, with the pre-tournament title favourite pushing Alor Setar-based Subramaniam all the way to five games. Chu, who lost out to Subramaniam in the final of the third stage back in April, went 2-1 ahead after weathering an early storm from her opponent in the first and third games. But Subramaniam battled back and dropped just six points across the final two games to wrap up a 9-11, 11-4, 9-11, 11-4, 11-2, victory and lift the fifth PSA World Tour title of her burgeoning career. "I'm very happy to win my fifth PSA title," said Subramaniam. "I played very well today, even in the first and third game I was leading 9-3 and 9-6. I lost them, but I managed to take the fourth & fifth games to win." In the Men’s event, Kamal avenged his semi-final defeat to Eain Yow on the opening stage of the 2016 Malaysian Tour to capture the first PSA World Tour title of his career. The 20-year-old had upset fourth seed Valentino Bong and top seed Elvinn Keo en route to the final and continued his fine displays into his final encounter with compatriot Eain Yow, recovering from 2-1 down to triumph. "First of all, I'm happy to win my first PSA title after being in the final five times before,"
"I would like to say thank you to my parents, who have been supporting me since the beginning, and thank you to my coach, who has been helping to improve my game all this time. I hope that I will win more PSA titles in the future."